The New KRISS Vector Gen II in 10mm! You are here: Home / Firearms / The New KRISS Vector Gen II in 10mm! KRISS has just announced their new Vector Gen II chambered in 10mm Auto. The addition of the 10mm option has answered a strong request by many fans of the innovative sub-gun, and could become one of the more popular models for KRISS. When the KRISS Vector first arrived on the market, the stubby .45 ACP sub-machine gun was heralded for its unique appearance, and innovative recoil reduction design. Though the KRISS Vector did a very good job at reducing the .45 ACP recoil, there were nearly immediate calls for additional calibers. The next KRISS Vector option was chambered in the very popular 9mm, and had some thinking the Vector could become a competitor for the highly popular HK MP-5. However, that has not received as much traction as some thought it would. The KRISS Vector is one of the most intriguing firearms. 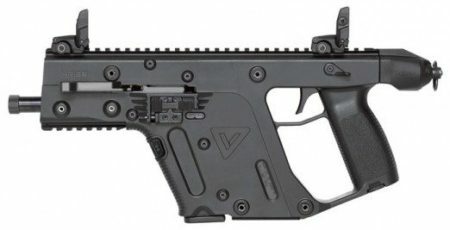 The KRISS Vector II comes in the same configurations as the other Vector’s, including the closed bolt, delayed blowback action. The most innovative feature of every KRISS Vector is the incredibly innovative Super V Recoil Mitigation System the firearm was built around. This system redirects recoil downward in the enlarged lower receiver, instead of traditional straight-back systems. The patented KRISS Super V System should do well for the more powerful 10mm Auto, channeling the powerful energy of the cartridge to reduce muzzle rise and keep the shooter on target. Just as impressive is the interchangeability between calibers, which can be completed in minutes and without any Armorer tools. Vector SMG (Select Fire) – LE and Military only. The KRISS Vector firearms have always been designed around Glock magazines. Considering the near 20-year dominance of Glock in American law enforcement, the decision to base the KRISS Vector on Glock magazines was a wise market move. 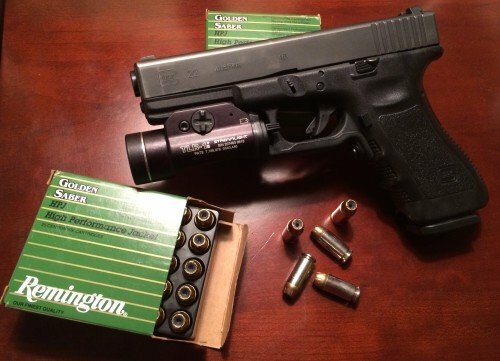 The Glock 22, in .40 S&W, has been a very popular law enforcement cartridge. I’d expect to see a .40 caliber KRISS Vector coming soon. The 10mm Vector II is no different, and will come standard with 15-round Glock G20 magazines. For those who live in restrictive States, KRISS conforms to those requirements with 10-round magazines as well. The 10mm Vector II will also have the Cerakote options of Flat Dark Earth, OD Green, Combat Grey, and Alpine White. Overall Height: 6.8 inches (175 mm). The KRISS Vector II SPD in black. MSRP: $1349.00 (additional for Cerakote). The Vector II SDP-SB in FDE has a support brace to enhance . MSRP: $1499.00 (additional for Cerakote). KRISS Vector SBR in Alpine White, is shorter than most carbines. MSRP: $1549.00 (additional for Cerakote). The Vector II CBR in OD Green has a collapsible stock and enhanced 16″ barrel shroud. The KRISS Vector II SMG has full auto capability and is restricted to LE and Military sales. From the first time I handled and shot a KRISS Vector at SHOT Show I was impressed with its feel, function, and recoil reduction. For a sub-gun, I appreciated the system being built around Glock magazines, that many law enforcement agencies use for their sidearm. Since 9/11 many law enforcement agencies have armed their officers with patrol rifles, the AR-15 being the most widely used selection. During this same time many SWAT Teams also transitioned from a pistol-calibered sub-gun, like the famous HK MP-5, to the rifle-calibered AR-15. There was a lot of sound ballistic data to support the transition decision, especially the performance necessary to successfully penetrate intermediate barriers and body armor. However, it could be argued Patrol officers could be just as well equipped with a pistol-calibered sub-gun that matches their on-duty pistol magazines. The ability to feed both weapons from the same magazines is very enticing. The KRISS Vector II could fit that need very nicely. Having a pistol-calibered sub-gun for some Entry Team members of the SWAT Team could also be appropriate, especially for crowded apartment buildings.